Nothing says Christmas quite like Santa. That’s why here at ChristmasLand we have all manner of Santa Claus themed Christmas Decorations and Ornaments. Make sure to pop in to our ChristmasLand store to find the Christmas Santa Decorations that will make your Christmas that little bit more merry! 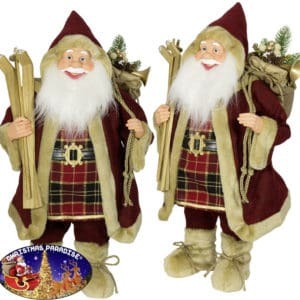 You're browsing Ireland's very best selection of Santas statues and figures. Our figures are richly detailed and will stay beautiful for years to come. Get free delivery on all orders over €95 online. Check also the best range of top quality artificial Christmas trees in Dublin. Our expansive selection of Christmas decorations includes lights, trees, tinsels, baubles, ornaments and other assorted accessories in traditional and contemporary designs. In classic silver and gold, and festive bright colours we have something to suit whatever colour scheme you choose. We have Santa figures and reindeer, angels , stars and snow: all the elements needed for a traditional Christmas scene display. We can help you create something fun and frivolous or stunningly elegant. We also stock Dublin's most fantastic selection of artificial Christmas trees. Christmasland offers Ireland most extensive range of Christmas lights. This includes indoor Christmas lights, outdoor Christmas lights, battery powered Christmas lights and more. Whether you're looking to decorate a room, accessorise a festive feast or just fill some Christmas stockings; we've brought everything you might need together in one place. Shop online at your leisure, with the confidence of secure payments, and prompt delivery. Our showroom is open 7 days a week at Goatstown Cross, Goatstown, Dublin 14, Ireland. Outside of the Chirstmas Season, Christmasland.ie operates as The Outdoor Scene and offers Ireland's best value Garden Furniture and Barbecues. ©2016 Christmas Land. All rights reserved.